While yesterday’s entry presented national evidence of the downtown movement, what about local evidence? Syracuse, New York is one of many small cities investing in downtowns as they transition from a manufacturing economy to an information-based one. Step One: Designate a depressed warehouse (ie manufacturing) district, Armory Square as a historic (and very affordable) neighborhood, thus encouraging artists and entrepreneurs to settle there. Sound familiar? Step Two: Identify key historic buildings for public-private investment, and target them toward the creative class with the help of economists like Richard Florida, who coined the term. Step Three: Enjoy the results: 2500 residents and counting call downtown Syracuse home. The occupancy rate for downtown apartments is at 99%. Syracuse University moved 600 students to a building in Armory Square. The projected investment in 2006 exceeds $180 million, including 180 market-rate apartments and condos; 550 hotel rooms; 750,000 s.f. of renovated space and 265,000 s.f. of new construction. As a native of Syracuse, I couldn’t agree with you more, Syracuse really is thriving! As a student in the Environmental Design program at the University at Buffalo. I have a unique perspective in that I know the two different downtowns of both Syracuse and Buffalo pretty well, and let me tell you, Syracuse is amazing compared to Buffalo! It really is a prime example of a thriving city center, and one that alot of cities could learn from. 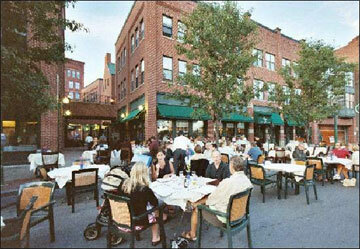 Thank you for the over view of the creation of a vibrant Armory Square in downtown Syracuse. Let us not forget the time and effort that has gone into the area to date, not to mention the time/effort needed to continue the progress. I hope to see the same efforts in other areas of downtown produce the same success, in time connecting the various alcoves of downtown into one interconnected community. I invite you to take a stroll through downtown. It doesn’t look like that photo. They only bring out the chairs for special “festival” days, which bring in flocks of suburbanites for half a day. Those people are sitting in the street – that isn’t an average day downtown.